Another Beautiful Day in Paradise. We had nice cloudy skies, temperatures in the low 80s and a tiny SW breeze. 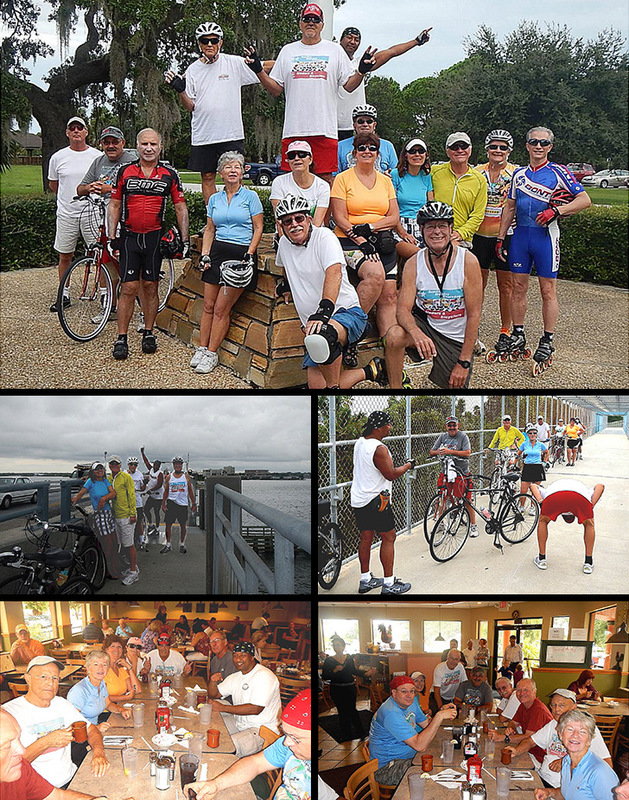 Bladers/Bicyclers Steve G, Rick P, Breeze, Roy H, Rob H, Herb E, Patrica K, Ginnie S, Barbara M, Nick S, Joanie C, John L, Janice H, Charles C, Dee T & Bruce M came. Welcome all. We decided to head South as the wind was out of the South and the trail is smoother going South. We ended up in two groups. One group did 11.5 Miles and the other group did 12.5 miles. The groups thought about going further but we had some ugly rain clouds coming in on us. However we only ended up getting a few drops of rain. We had 2 Bladers and 14 Bicyclers. We Brunched at Rodie's as planned. We got in after about a 10 minute wait and seated at one big long table. Service was good and the coffee flowed freely. We gave Rodie's a 9.5.